Although I'm finding it extremely difficult to believe that it's November already, I am super excited that it's Thanksgiving season. I'm already menu planning! Okay, okay. I'll be honest. I'm thinking about the Thanksgiving desserts. We always go to my sister's and she provides the meal and I bring the dessert. And there's really no 'planning' involved. It's the same three desserts every year. But I have already started making the grocery list. 3 Pumpkin roll cake or pumpkin cookies. Okay, okay. It's the same three out of four desserts every year. I always plan to make the pumpkin cookies but nine times out of ten, I forget to buy the required orange juice so we make pumpkin roll cake instead. Don't ask me what it says about my family that we have three tons of cream cheese and four tons of powdered sugar on hand, but no orange juice. I'd like to say it's because we're healthy & we drank the all the juice but.... I'd be lying. So, what about you? What are your traditional Thanksgiving desserts? There are just the two of us, so we always opt for pumpkin pie. It's my husband's most fave, and he makes it, so who am I to complain? 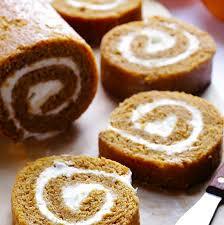 Sometime I would like to try pumpkin roll, though. Pumpkin Pie and Chocolate Pie. Yum yum! I always make pumpkin pie (with whipped cream) so I can indulge in a piece for breakfast the day after Thanksgiving. I bet that pumpkin roll would also make a pretty good breakfast!